Whether you’re a recording and producing enthusiast, or have a professional studio, you need good equipment. Besides a good PC, a MIDI controller, and a solid audio interface, studio monitors are a crucial part of your rig. I made music for about two years on a hi-fi system before I got studio monitor speakers. Honestly, don’t lose more time and get monitors if you haven’t, it’s night and day for your mixes. Sure, you could get work done with a simple pair of speakers. 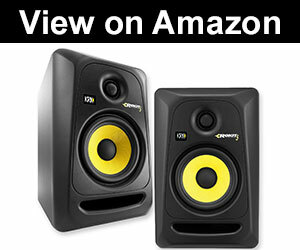 But in order to achieve a higher quality level of your recordings and mixing work, having the right pair of studio monitor speakers are essential. It’s like you’ve been painting in a dim room only lit with a candle, then someone brings a proper light spot for your desk and you discover all sorts of mistakes you couldn’t hear before. What to look for in a monitor? How do you choose the best bang for your bucks? Those are some of the questions we are about to answer, as we dive into the world of the studio monitor speakers, and go over the top 10 best studio monitor speakers on the market. Though the slightly smaller size of these monitor speakers may make them seem as not that powerful, the Rokit 5 G3 by KRK pack a serious punch. As they are oriented towards DJs and producers of bass- heavy music, they are a perfect choice for anyone looking for a pair of good speakers with a kick in the low-frequency end. A 5” woofer coupled with a 1” dome tweeter is a perfect setup for beginners and intermediates getting into sound production or just value high- definition audio. The back of these puppies offers an unbalanced RCA, balanced TRS as well as an XLR input, so you can connect pretty much anything from your studio to them. Besides the inputs, there are also knobs for controlling volume, lows, and highs. Having this option comes in handy when you can’t reach your mixer or simply prefer tuning the EQ on your speakers. As one of the most promising KRK monitors in the world of entry level speakers, the Rokit 5 G3 are a great way of starting your hobby or career as a sound mixing enthusiast. With a more than an affordable price for a pair, all the essentials are present and packed in a stylish and sturdy black and yellow body. Yamaha, as one of the most popular music equipment company, has once again shown that they know their business. The HS8 is our pick as the Best Studio Monitor, and here’s why. The elder brother of the very well received HS7 has maintained all the praised features and adds a little extra. The 8” woofer, being a bit larger than the one on HS7 provides the user with more headroom as well as a tighter bass response. While testing this model, we found that the sound it produces is simply spot-on with the intentions we had while mixing. A very useful feature this model has are the room and high- trim settings, which you can tune in order to adjust the sound perfectly in accordance to the size of the room you’re using the speakers in. A simple design capable of delivering amazingly rich and balanced sound is what these are all about. 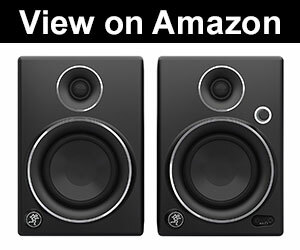 Getting a Yamaha HS8 pair for your studio is an investment you won’t regret, as these are the best monitor speakers you can get in 2017. Behringer with their MS16 studio monitor speakers shows that you don’t have to bust your bank in order to get a decent pair of producer speakers. 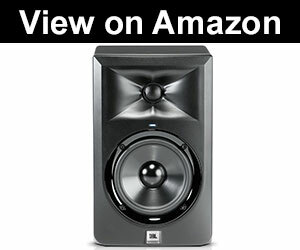 These 16W bad boys offer a wide frequency response, ranging from 80 to 20 000 Hz. The high-quality sound is coming from a 4” woofer and 1.5” tweeters designed to give you the most realistic image of the music you’re mixing. With a separate mic input, you can even connect a microphone, which is a perfect solution for communicating with the people you’re recording. The front also sports bass, treble and volume controls, for easy access on the spot. 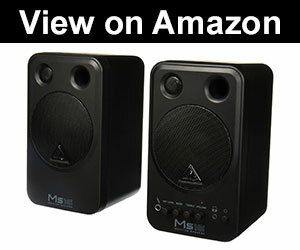 As a pair of the MS16s costs less than $100, there is a noticeable difference in the overall sound quality. Though there are better solutions, as a budget studio monitor, this model does the job with style. Being our pick as the best budget studio monitor speakers, we found no issues with the MS16 in the basic mixing and producing tasks. If you don’t find them satisfying enough, you can always use them as a pair of bedroom speakers, as they, at the end of the day, sound quite nice. Opting for a small monitor solution doesn’t have to mean you’ll be missing out on audio quality. The CR3 pair by Mackie shows exactly how. Inside the nicely designed gray-green body you will find a 3” woofer coupled with a 0.75” tweeter. Though this may seem as too small to be able to provide the listener with any kind of noticeable sound improvement, the audio is surprisingly well balanced. 50 Watts of power is easily controlled by the volume knob on the front, while the back is reserved for multiple input options. Doubling as more than just studio monitor speakers, the CR3 offers an aux input for your phone, a headphone output for private sessions, as well as a left/ right speaker switch, which allows you to control the speakers separately. If you hate having to hassle with cables and wires, the CR3 has got you covered as it features Bluetooth connectivity. If your desk is already packed with various other pieces of equipment, the CR3 is your go-to solution. As one of the best desktop monitors, and at a price point at around $100 for a pair, they make a solid investment. Known as the best speaker company for quite some time, JBL has once again proved themselves with the LSR305. With a setup intended for optimal quality as well as versatility, the 82W of sheer power is capable of excellent performance. A 5” woofer and 1” tweeter are powered separately, each with a dedicated 41W amp, providing an audio image with more clarity than the majority of competitors. A notable thing which makes JBL stand out, even more, is LSR305’s wider center image, meaning that the sound waves can more easily be dispersed across a much wider area. Filling up your studio with audio, no matter its size isn’t going to be a problem with this studio speaker. In order to get the most out of the low- end frequency range, the LSR305 is also equipped with a Slip Stream Port design, improving the bass response. Magnetically- shielded transducers ensure that no interference is present even in the most device- crowded settings. All things said the LSR305 along with its great sound and sturdy design makes for one of the best home studio monitor speakers, and my personal favorite. 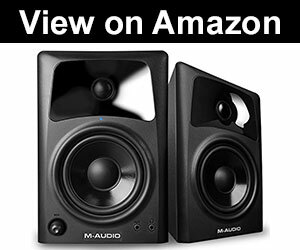 One of the more popular companies in the world of audio equipment, M- Audio presents their AV42 as one of the best speakers for the money. The 4” woofer and 1” tweeter provide the user with a clear and punchy sound. As the frequency response is quite nice, ranging from 75Hz to 20kHz, you will find these speakers more than nice sounding. The tweeter waveguides direct the sound in a way that it fills the room, no matter the size, easily, and without any sound distortion. With magnetic shielding, virtually no interference is present, perfect for placing these puppies next to other electronic devices which in other cases may have an effect on the sound. The front boasts a headphone jack as well as an aux input, so you can plug in any device imaginable, making these not just one of the top-rated speakers, but a good solution as the best home speakers, perfect for movies and music when you’re not mixing and recording. The AV42 offer an overall positive experience. Though they don’t have any special or distinguishing features, they provide the user with tight, balanced, and natural sound, for a decent price. The CR4, as the older brother of the previously mentioned CR3, had to be included in this list, for its larger dimensions and overall impression. Rocking the same design as the older model, the CR4 also comes in that recognizable gray/ fluorescent green color pattern. However, having a bigger woofer, this time a 4” one, can make a big difference in the overall audio experience. 50W of power drives the woofer and a .75” tweeter, capable of delivering just about enough sound power. As these come with rear-firing ports, keep in mind that you will have to leave some space behind the speakers to get the optimal sound quality. Not offering a truly flat response in our opinion doesn’t make this model a bad option. 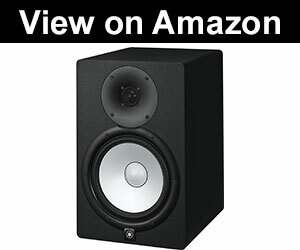 We consider these as probably the best speakers for music listening in general, or from a recording/ mixing point of view, relatively cheap studio monitor speakers that do the job quite nicely. If you like the design and the features of the CR3, but need a bit more power and prefer bigger woofers, go for the CR4. Besides the previously mentioned KRK Rokit 5, these monitors are a perfect way of getting into music mixing and producing. As the smallest member of the PreSonus Eris monitor lineup, the E4.5 are one of the best cheap speakers that offer much more than you would imagine with their relatively low price. These are passive speakers, with one of them having a built-in stereo amp. Marketed as near-field monitors, no hiss and hum were present when we tested them, which can be an important buying point for some people. On the back of these sturdy speakers, there are your standard I/O options, with mid and high controls, alongside a low cutoff and acoustic space switch. All in all, the E4.5 by PreSonus stands as a well- built budget monitor, with a performance that should satisfy both beginner and more intermediate sound producers. Great for both home and professional studios, this one is definitely a good investment. Though we included the HS8, HS5 as its little brother has also a lot to offer. 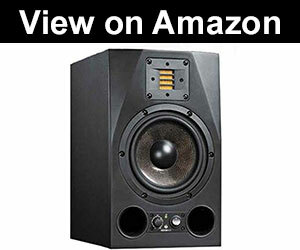 As the HS5 comes in a slightly smaller package, it’s regarded as one of the best home studio monitor speakers you can get. The 5” woofer coupled with a 1” dome tweeter do come in smaller than the HS8, however, this is compensated as the power output of this model clocks in at 70W. Reaching as far as 54Hz on the lowest end of the frequency range is easily felt, with the bass on this bad boy sounding amazing. If that somehow isn’t enough for your needs, you can even go for the option of including a subwoofer which pushes the low end to the max, reaching 22Hz, which is the limit of human hearing. 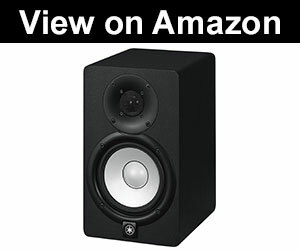 Yamaha studio monitor speakers have been known for their premium build, and the HS5 is no exception. Sturdy, yet not too heavy, they are the best speakers out there when it comes to durability. As a very well rounded monitor option, the HS5 shows why Yamaha is still one of the most trustworthy companies out there. And with that good of a price point, we can even say that these can be considered as budget speakers as well. And finally, at number 10, we have a special treat. We’ve covered a lot of entry-level and home studio options, but now it’s time to have a look at what we think are the best pro studio speakers you can get. Very well known in the world of near field monitors, the A7X by Adam Audio is a beast. Every detail of these speakers is there in order to get the absolute maximum from your audio source. The 7” woofer is coupled with a 2” tweeter, which is something we haven’t had the opportunity to see in the other monitors we’ve reviewed. This means that with a low end of 42Hz, even the lowest notes will be clearly heard, as the sound isn’t 20dB quieter at that frequency, as it is with most other speakers. There is also an option of coupling these with an Adam Audio subwoofer, but we found the speakers themselves to have more than enough low- end. Though it may seem like a subjective review, there really isn’t much to say when it comes to downsides of this model. Although these could be one of the most expensive pairs of studio monitors for a home recording, with a price point a bit less than $1000 for one of these bad boys, we could hardly find any flaws. If you own a professional studio and want to upgrade your monitor setup, while having a big budget, look no further than the A7X. As probably the most important piece of studio equipment, at least when it comes to audio output, monitors can make a huge difference in the way your final mix sounds. Though they can be pretty expensive, you can find a myriad of budget-friendly ones, capable of doing a solid job. As they are specialized for doing producing and music recording, there are a couple important benefits they provide you, when compared with standard speaker setups. You could do all your work on a pair of good headphones, but sometimes you just need to hear and feel the music you’re working on in a different way. Besides, having headphones on your head all day can get quite tiring. As with any piece of musical equipment, there is truly a wide variety of things to consider when looking for the best music speakers. Woofer/ Tweeter Dimensions – Bigger woofers and tweeters do offer a wider frequency range in which they operate, but they also tend to cost more. The material used for these components is also important, as this is the part of the monitors where wear and tear occurs. Do I need one or two speakers? – Opting for a pair is usually better, however, if you’re on a tight budget, it’s sometimes smarter to get one higher quality monitor, and get the other when you can. Passive or Active? – We could write a separate article on the differences between active and passive speakers, but for now, just have in mind that passive speakers need a separate amp. What about Subwoofers? – The low end a pair of monitors provides is usually enough for most mixing sessions, however, a good subwoofer can help you with bass- heavy songs. In any case, you can always pop your headphones on and take a closer listen. Consider your Budget – The more money you spend, the more you get. At least to a certain point. We will try to cover the best options, from the budget-friendly to the more expensive ones. With these things in mind, you should have a better picture when it comes to choosing studio monitor speakers for your needs. As we’ve seen, there are truly different options when it comes to the best studio monitor speakers you can get. But, considering all the factors, features and specs, some are, in different categories, a bit better than others. 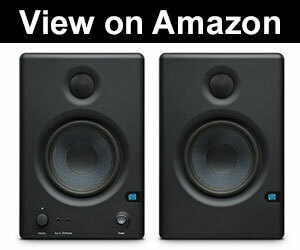 Yamaha HS8 is our choice as the best studio monitor setup, with above- average high definition audio and build quality. As a beginner, our recommendation would be the KRK Rokit G3, offering a balance of sound quality and price, or the Behringer MS16. On the other hand, if quality is your main concern, and already have premium equipment in your studio, go for the Adam Audio A7X, our pick as the Best professional studio speakers on the market. That’s it guys, we hope that you found this article useful and that we’ve managed to help you with buying your next studio monitor speakers.